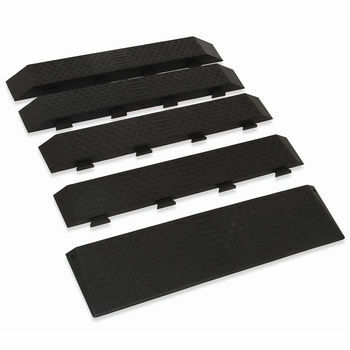 The Modular Rubber Threshold Ramps provide a durable, safe means of navigating entrances to many buildings including small steps and doorways. A clever locking system allows for easy installation and variable height of up to 75mm in total. Each additional piece provides extra height up to a total of 5 pieces with a 75mm rise. A Modular design makes the Rubber Threshold Ramps a practical and affordable home accessibility solution. Constructed from high-impact recycled rubber for durability & long life.